Just a Boot Print or the Real Deal? Readers of my last piece on dinosaur bones may have been left wondering, but I'm often drawn to stories that have a strange and unique angle. That's also one of the reasons I've shared the family's old stories of things ghostly or surreal from back in the days they lived around Thunder Butte. Something seemingly strange or unnatural happens in many peoples lives at one time or another. For example, in my own life there was one night when there were unexplained footsteps in the house that ended in front of my bedroom door the night when I was in college and my favorite uncle, Neal – the former police chief of Faith, South Dakota, died – I didn't learn of his death until the following morning. And, there was the time many years ago when I was working late in a congressman's office on Capitol Hill, and looked up from my desk only to see a man in old garb standing staring at me and disappear before my eyes. Also, there was the time backpacking in the Blue Ridge Mountains in Virgina when I and my fellow campers were awakened in the middle of the night by a large creature that came galloping (with the sound of horse-like hooves) by the tent and let out a loud and frightening mountain cat-like caterwauling. (We were too afraid to step out of the tent with our flashlights until the creature galloped off into the distance and could be heard no more.) But, again, these were rarities and didn't affect my fundamental beliefs or the way I live my life. For most people, such events are rare, perhaps even a trick of the mind, and we go about our personal lives. However, I do scan the local South Dakota news occasionally and read with interest recently that there have been a number of sightings in and not far from Thunder Butte country of Bigfoot, Sasquatch, or as the Lakota apparently all him in English, the Big Man. I also discovered that there is some lore among the Lakota about such creatures, who they reportedly describe in their own tongue as chiye-tanka or chiha-tonka, which means great or big elder brother. You see, I grew up on tales of Sasquatch in Northern California – and it was something I used to think about when we took family camping trips to California's Trinity Alps. My childhood nightmares would be filled with images of the big hairy ape man ripping our tent open and carrying us off into the woods at night. But, frankly, this is something that doesn't pass down to me through family tales, and I've never heard of it before as part of South Dakota lore – until now. 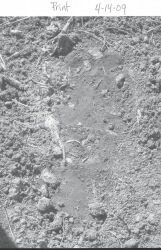 Loren Coleman, at cryptomundo.com just posted last week a photo (here) supposedly taken of a Bigfoot footprint on the Pine Ridge reservation in April. To my admittedly untrained eyes, the photo looks suspiciously like a boot print, although I'm not in a position to say what it is. Coleman also reports a wave of Bigfoot sightings in South Dakota in 1977, including one up by Timber Lake (here), which isn't very far at all from my favorite butte. Although Loren Coleman often appears on the History Channel on programs such as Monster Quest, this programming is often entertainment-oriented, and there is no reason one should check their healthy skepticism at the door. I don't vouch for the credibility of Coleman's work, nor am I necessarily impugning it. People see strange things and he collects, writes, and talks about some of those reports. Even South Dakota Magazine has reported on Bigfoot sightings in the past, including the Badlands – perhaps with some tongue in cheek. Interestingly, too, there is an outfit called the Bigfoot Researcher's Association, which maintains an online database of Bigfoot sightings, including 16 reported sightings in South Dakota from 1986 through 2008. You can view the sightings reports here. Some of these sightings have been near enough to the Thunder Butte area, including Corson, Dewey, Meade, and Pennington counties. Now, as far as I can tell, these supposed eye witness reports are of varying quality, and the Association does not provide identifying information about those who have reported to its database. One thing is certain, however. People see strange things. Don't let me leave you with the wrong impression – I'm not saying Bigfoot is real. If such things existed, I can't imagine where they would hide themselves out on the prairie. But, one thing is sure. The stories are curious and add to the local lore of an interesting place. Yes, I respect what people tell me they see and find, but I totally agree that open-minded skepticism is the best route for most active cryptozoologists like myself. I check deeply into everything that comes my way, before it makes it to print in my books, blog, or articles. Part of my foundation, needless to say, is my ancestry of Eastern Band Cherokee-Scottish parents and grandparents, where a view of the natural world nicely mixes with my academic backgrounds in anthropology, zoology, and the psychiatric fields. Thank you for taking the time to give a fair overview of this topic. I've already corrected the spelling of your name and another typo in my story. I hope I didn't offend you. I'm not discounting all eyewitness reports, nor those covered by you. I believe that we should all approach such things with a healthy dose of skepticism. Some reports of these things obviously have more credibility than others. Frankly, we're all richer to have a few people like yourself who have the time and resources to probe these reports. By the way, I really was terrified of the Sasquatch when we went camping in California's Trinity Alps in the summers. My Dad took out a couple of remote mining claims on National Forest land that became our very remote camping sites. Sometimes, I used to hike those woods alone and couldn't get over the feeling of being watched. Thankfully, I never met Bigfoot.